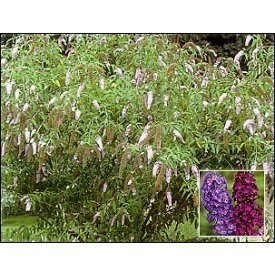 Butterfly Bush (Buddleia davidii) out door plants Buddleia davidii or butterfly bush is highly valued for its long purple blossoms that vary from 6 to 30" in length. It makes a fine addition to the shrub or perennial border. Attracts butterflies in profusion and is wonderful for cut flower use. Plant in mass 12" to 18" apart. Although the tops die back each year, the plant spreads and becomes larger the next. NOTICE: many of our plants and trees are shipped in a dormant condition. If you receive in dormant state soak overnight before planting. In general, these items can be planted anytime your ground is not frozen. An early snow or frost will not harm a nursery stock item that is already dormant. On the other hand, these items can also be planted during warm weather--simply be sure to water well.